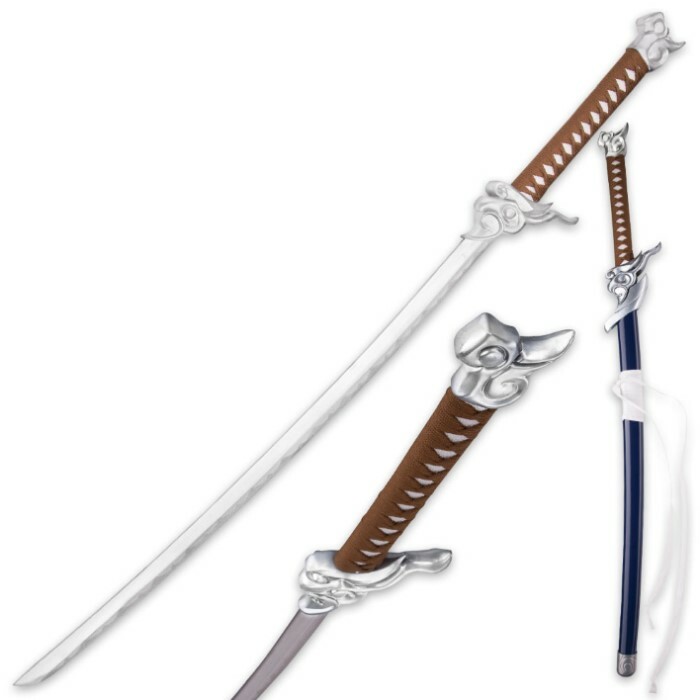 We present a high-quality and accurate replica of the Yasuo Katana from the popular “League of Legends.” If you’re a fan, you really need this incredible reproduction sword. The blade is 26 4/5” of carbon steel with a sanding polished finish. It also has an intricately detailed metal alloy guard and fittings, and, the handle is made of hardwood that is traditionally wrapped with brown nylon rope. A lacquered, hardwood scabbard is included. This katana is 43 3/10” in overall length. I honestly wasnt expecting much when i opened the post i recieved this morning. 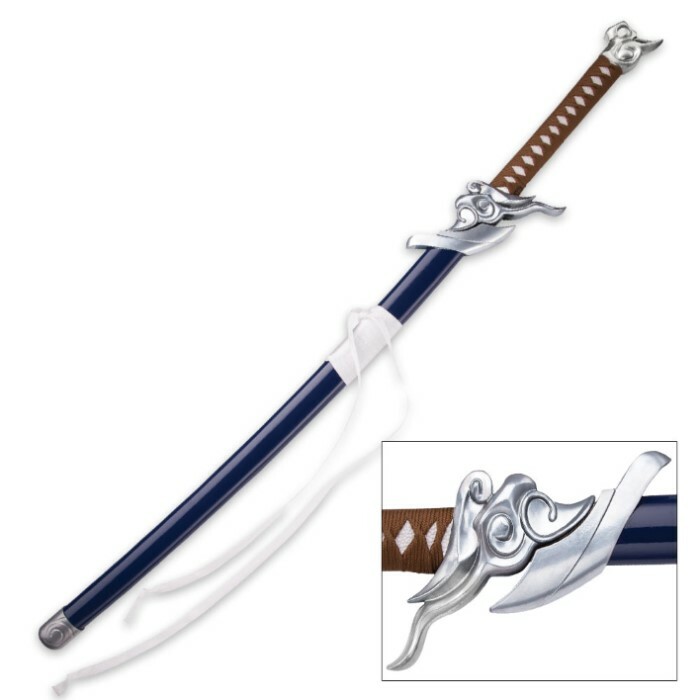 The Yasuo katana had me scratching my head for a few days before i decided to order it. I generally do not purchase display pieces, as i prefer swords that have functionality. Let me say that this sword has weight and the blade is sharp! Not real sharp but i can fix that easily. I was able to slice a piece of copy paper but then ran into a area on the blade where the edge went awry. If you were like me and on the fence, buy this katana! At this $ they wont be here for long... The blade i got has no wobble, feels pinned very solid. (Maybe I'll try to disassemble lol). 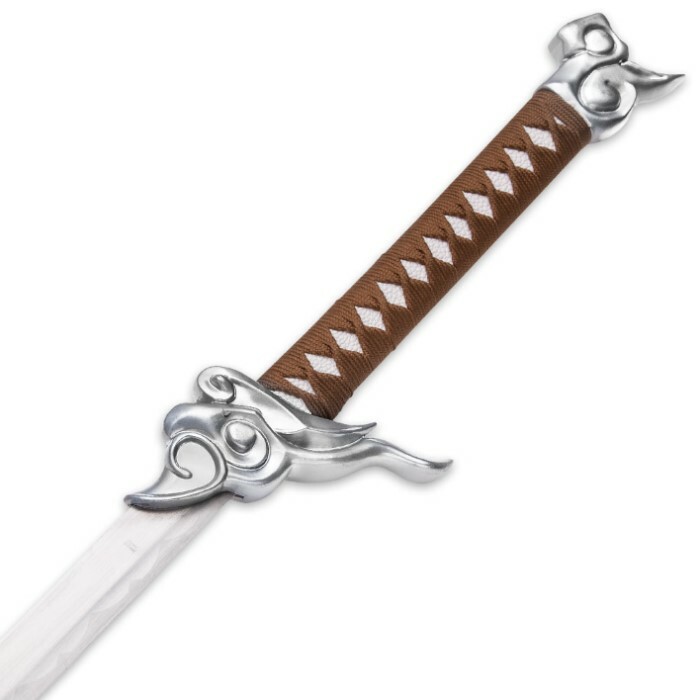 Also I want to believe that it is full tang as i pinged the pommel and it seemed to resonate the blade, but im not entirely sure as this sword is not really made in the traditional ways. Very beautiful and definitely a conversation piece at the very minimum. I have zero regrets buying and as i write these words, considering buying 2 more to repaint in different color schemes. The Sword I received doesn't seem like some cheap display. It different, and would be proud to hang it next to my Musashi, Honshu, Cold Steel and Shinwas!